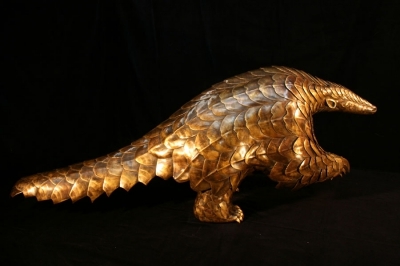 Captivated by this elusive nocturnal mammal since a child, it was for many years my intention to create a pangolin from metal. Being based in Europe, my first problem was finding a live specimen or even photos from every perceivable angle. This problem resolved… but where to start? As it was to be made from bronze and brass and welded together from the inside, my only option was to start with the tail. So slowly over the months he grew into a 1.4 meter long pangolin. Having completed the metal work and wishing to have a natural looking patine, it was bath time – not such an easy process with a 70kg pangolin! Left mouse click on picture to start slide show! 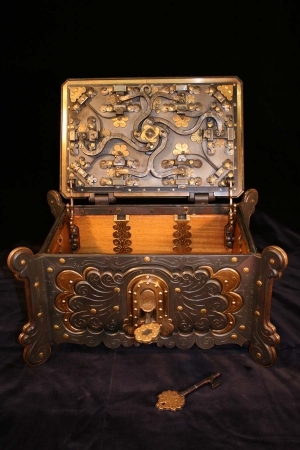 An on-line auction house is really responsible for this chest. After purchasing a few of these old baroque door locks and either making keys or fixing the locks, my passion for these fascinating pieces of engineering was endless. I decided to build my own 6-way-lock, and to make it really interesting only with riveting it together. Made from bronze, brass, iron, spring steel and wood interior, it took around 2000 hours of forging, filing, chasing and finally riveting to put this 75kg-piece together. All the iron work has been sand blasted and then reheated for an even coloured finish, after which sealed with a clear matt coating. The bronze and brass has a lightly patina.